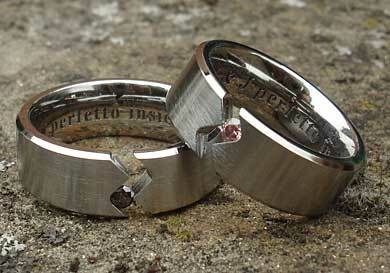 Unique Titanium Engagement Ring : LOVE2HAVE in the UK! A unique titanium engagement ring which we would describe as a zig zag tension set black diamond titanium ring suitable for those looking for a very unusual titanium engagement ring. It measures 7mm wide with a single 2.5mm/0.06 carat black diamond. The version pictured here is in a satin finish, and the attention to detail includes a stylish bevelled edging that catches the light beautifully. If you require a polished finish, please specify this in the comments box at checkout. 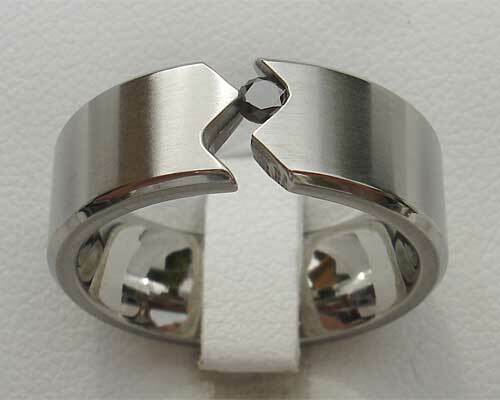 Titanium tension set rings such as this one are very popular with our customers, and they make unique engagement rings for men too. Other colour stones are also available other than black, so please email us for further details. Please note that our tension set rings are aircraft grade titanium used for its extra tensile strength, crucial for holding the diamond securely in place. 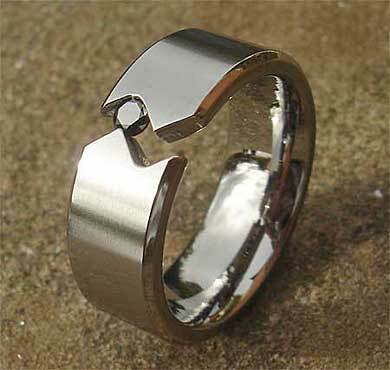 It is not practical to resize rings made from this grade of titanium. It may be possible to resize up slightly (depending on the design of the ring) but not down. Precious stone(s) Available: 1 x 2.5mm/0.06ct black diamond.